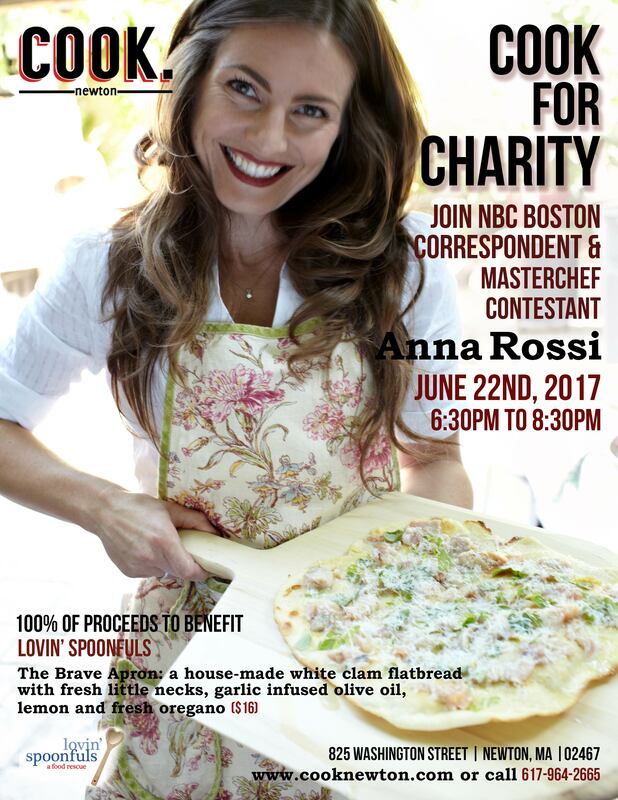 We are welcoming NBC Boston correspondent Anna Rossi as part of our continuing “Cook for Charity” celebrity chef series. On Thursday, June 22nd, 2017 from 6:30PM to 8:30PM, Anna will trade in her microphone and get cooking with our Executive Chef/Owner Paul Turano, where they’ll be serving up flatbreads to benefit Lovin’ Spoonfuls!! We will be serving up “The Brave Apron” special, a house-made white clam flatbread with fresh little necks, garlic infused olive oil, lemon and fresh oregano, $16. 100 percent of sales from each $16 “The Brave Apron” flatbread will be donated to Lovin’ Spoonfuls. Lovin’ Spoonfuls is dedicated to facilitating the rescue of healthy, fresh food from grocery stores, produce wholesalers, farms and farmers markets, and distributing it to community non-profits that feed hungry people across Eastern Massachusetts and the MetroWest. Lovin’ Spoonfuls is committed to addressing the health, environmental, and economic impact that food waste has on our community. The regular menu will also be available. For more information, call 617-964-2665. Reservations are recommended.